Our Favorite Pizza in Valencia: Endavant »« Weekend Festivals – Kites & Alternahh…. tivity? 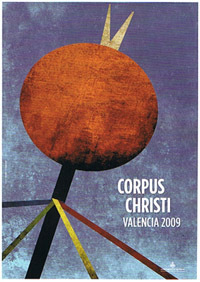 Last year, nasty weather ruined our first Corpus Christi in Valencia, so we’re greatly looking forward to this year’s celebrations. The Rocas – On Friday evening, the Rocas are brought to the Plaza de la Virgen. Rocas are huge, wooden floats, beautifully hand-made and in some cases centuries old. They depict biblical mysteries, and are kept safely inside La Casa de las Rocas (location) until Corpus Christi. You’ll have plenty of time to view them on Saturday, when they spend all day in the plaza. Concert of the Municipal Band – At 23:00, the Plaza de la Virgen will be the scene of a performance by the talented Municipal Band of Valencia. Their show will feature traditional music of importance to the Valencian Community, and will be followed by fireworks. Cabalgata del Convite – At noon, a mounted procession winds its way around Plaza de la Reina up towards the Almoina. This cabalgata is famous for its dancing, and for the strange tradition of the degolla — literally, the throat-slitting. King Herod’s masked henchmen run riot through the streets, “killing” infants by tapping them on the head with a stick. Onlookers take revenge on them by splashing buckets of water from the balconies. (Seems fair enough: you kill my infant, I’ll make you wet!) A good place to watch this is on C/ Avellanas — it’s not to be missed. Paso de las Rocas – The Rocas are the protagonists of the afternoon parade which gets going at 16:30, and does a large loop through the city, ending at the Casa de las Rocas. This will be an energetic parade, full of music and excitement as the Rocas are quickly wheeled around the city center. It goes past very quickly, so don’t be late! Official Procession – At 7pm is the day’s third and most traditional parade through Valencia’s streets. This procession is Corpus’ biggest, with falleras and politicians joining marching bands and a host of biblical characters. You’ll see a lady dressed from head to toe in white, who’s probably the most emblematic character of the festival — she represents virtue in a world of sin, and blesses on-lookers with her magical Virtue Wand. Bells – If you’re going to be in the city center all weekend, I sure hope you really enjoy church bells because they will be going off constantly. For me, the sound progresses from “beautiful, soothing background noise” on Saturday morning, to “maddening, please-make-it-stop torture” on Sunday evening.